New to dentures? You are not alone. Millions of people receive dentures everyday as a wonderful solution for the replacement of missing teeth. 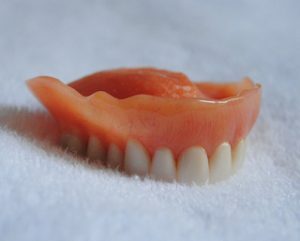 Come to think of it, do you know of someone who uses dentures? Perhaps your grandma does, or an aunt or uncle. This is because dentures are an affordable, dependable solution for lost teeth. They continue to provide function and aesthetics to many people around the world. While dentures are a great tooth replacement solution, they can pose several problems when being used for the first time. The mouth considers false teeth to be a foreign object; hence, you will need to adapt to your dentures during the first few months of wearing it. Here are the 5 most common denture problems with suggestions and techniques on how to overcome them. This is a normal feeling because dentures are removable dental appliances. You can remedy the situation by using a dental adhesive. This will prevent your dentures from moving and keep them in place. Using an adhesive can greatly help you get accustomed to wearing dentures. This is another common situation faced by new denture users. This can be solved by eating soft foods like egg and gelatin while avoiding foods that have the tendency to stick to the teeth. Use both sides of your mouth when chewing and grinding food. This helps create the feeling of balance and symmetry when eating with your false teeth. Don’t worry! You will eventually get used to eating with your dentures, and be able to eat a variety of dishes. One of the goals of using dentures is to help you pronounce words better. However, using them for the first time may pose a degree of difficulty. Try to speak slowly and more frequently than before. Talk to your pet or call someone on the phone. Read books out loud. The only way you’ll get used to speaking with dentures is to speak a lot. In time, you will be able to pronounce words clearly. Again, this is normal. The mouth is still adjusting to the false teeth, so it copes in different ways. Mouth sores can be remedied by gargling water infused with salt. Always make sure, as well to keep your dentures clean. This will avoid mouth infections like stomatitis and cheilosis. If irritation persists until after your period of adjustment, consult your dentist right away. Your dentures may need adjusting and only the dentist will know what to do. If you need to replace one or several missing teeth, visit us at Buckhead Dental Partners. We have been providing patients with dentures for many years with a high success rate. Our patients’ smiles and speech have improved. They are also more confident than ever because lost teeth have been replaced. Trust Dr. Jeffery Ballard to provide you with dentures that fit very well. Call us today at (404) 261-0610.